This post is an adaptation of the “TED Talk,” or a video lecture, that was presented by Harvard University’s Erez Lieberman Aiden and Jean-Baptiste Michel in September 2011 called “What we learned from 5 million books.” Essentially, the two researchers created a tool called the Ngram Viewer, which allowed them to search the millions of books that Google has scanned and made publicly available. The large volume of text—which spans centuries and now includes more than 8 million books and approximately a half trillion words—can provide insights into our world, our history and emerging trends simply based on the popularity of certain words or phrases. 1965 – Newborn screening initiated in the U.S.
Click on graph to see a larger view. Metabolic disorders were in the English vernacular long before PKU or newborn screening. But we can tell the results of this search correlate with the chronology of PKU. The PKU acronym appears as early as the 1930s—when Folling discovered PKU—but it does not pick up in frequency until the Guthrie test was created in the 1960s. Almost immediately or soon thereafter, the concept of newborn screening takes off. We now know that the Guthrie test, which was originally developed to screen for PKU at birth, has led to newborn screening tests for more than 40 developmental, genetic and metabolic disorders. One of the cool features of the Google Ngram Viewer is that you can use the characters “=>” to determine what words are used to modify other words or phrases. For this particular search, I wanted to see what adjectives were used to describe PKU. Was it disease, disorder or syndrome? As you can see here, disease is the most common descriptor for PKU while syndrome is the least frequently used term. Interestingly, disease is also the first descriptor we see in the literature—it appears that old habits are hard to break! When I was on the PKU diet growing up in Pittsburgh, Penn., my mother counted phe exchanges. When I first considered a return-to-diet not too long ago, I was advised to count grams of protein. However, after speaking to some other women with PKU, I’ve learned that counting milligrams of phe is a more precise way to track protein intake, especially when considering a PKU pregnancy. Given that experience, I wanted to see what published works in the Google library might suggest is most commonly cited. Here you can see that while the use of grams of protein started strong in the 1930s, tracking milligrams of phe has slowly gained popularity and eventually taken the lead. Interestingly, phe exchanges are not mentioned at all. For my last Ngram PKU search, I decided to compare the phrases PKU diet and PKU treatment. In the past, some PKU patients have been denied access to medical formula and foods because of the misconception that the PKU diet is cosmetic and for losing weight. Despite that barrier to PKU therapies, there has been little effort to change the language by which we describe medical care for PKU. Perhaps if Google expanded the scanned library of books to include the years beyond 2000, we would start to see a reversal in this trend. To be fair, there are some limitations to conducting this Ngram PKU experiment. 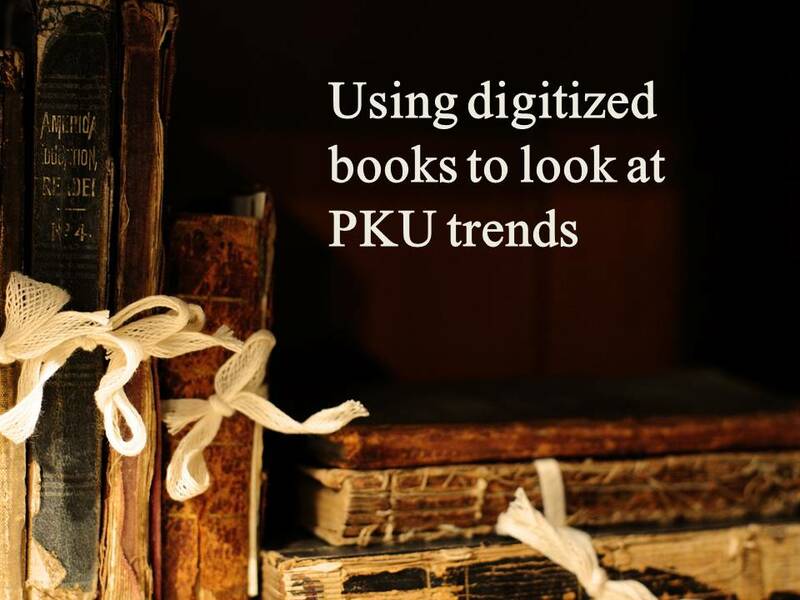 PKU literature is mainly published in research journals rather than actual books and more recent developments like the first FDA-approved prescription drug to treat PKU would not be included within this data. Nonetheless, I couldn’t resist having a look to see what kind of insight this tool might provide. Have you played with Google Labs’ NGram Viewer? What other PKU trends and phrases do you think would be interesting to search for? A revamped PKU.com is on its way! Just this past week, I was fortunate enough to participate in a telephone survey administered by a representative from GA Communication Group, a Chicago-based marketing agency that has partnered with BioMarin for the complete redesign of PKU.com. When I spoke with GA Communication Group, the agency was in the process of interviewing several subgroups of the PKU community including on- and off-diet patients, Kuvan patients, dieticians and PKU parents. The questions not only focused on the ways in which these groups used PKU.com, but there was also a genuine interest behind gaining more understanding into the complexities of receiving a diagnosis, talking about it with friends and family, as well as understanding the mechanics behind tracking and documenting phe intake. Pictured above is a screenshot of the current homepage for PKU.com. BioMarin and GA Communication Group have partnered together to redesign the site and hope to launch the new site later this year or by early 2013. There’s no surprise that a significant portion of the interview delved into the subject of new communication technologies. After all, a lot has changed in terms of the way we seek out and share information through online platforms. For example, when prepping for the telephone interview, I was surprised to learn that I had in fact created a PKU.com user profile when I first stumbled upon the site in 2007. Despite having registered an account, I didn’t actually fill out any of the empty fields under my profile. I speculated to the GA interviewer that in 2007 it was very likely that I was hesitant to put myself out there. Much has changed since then. Not only do I have a Facebook page, but most people I know would think I’m crazy if I didn’t have one! GA Communication Group and BioMarin plan to wrap-up the research phase of the PKU.com redesign effort very soon. However, it will be several months before the rest of us get to see the final product. Ultimately, I would like to see the new PKU.com have a more user-friendly interface – one that can be easily accessed from any number of electronic devices. I’d also like to see a portion of the site used for communicating current PKU research initiatives. With BioMarin sponsoring this site, I’m not sure how much of a conflict of interest that might present if there are other companies interested in PKU research. Perhaps a strategic partnership with either the National PKU Alliance or some other non-profit organization for managing that portion of content would help resolve that dilemma. On that note, how many of you regularly visit PKU.com? And if you’re familiar with the site, what would you change about it? I even thought it might cool to incorporate a Skype-like video conference feature so that registered users could chat with each other long distance. Whatever your thoughts are; be sure to submit them in the comments section below. Looking forward to hearing from you! Users can also export their prescription data into Excel or email their prescription history directly from their phone. This seems like an awesome feature for when you find yourself in a doctor’s office and have to list all the current medications you are taking. It is also nice to know that all data within RxmindMe is connected to the U.S. Food and Drug Administration’s database so that you can search for your drug(s) and perhaps investigate possible side effects or hazardous drug interactions. 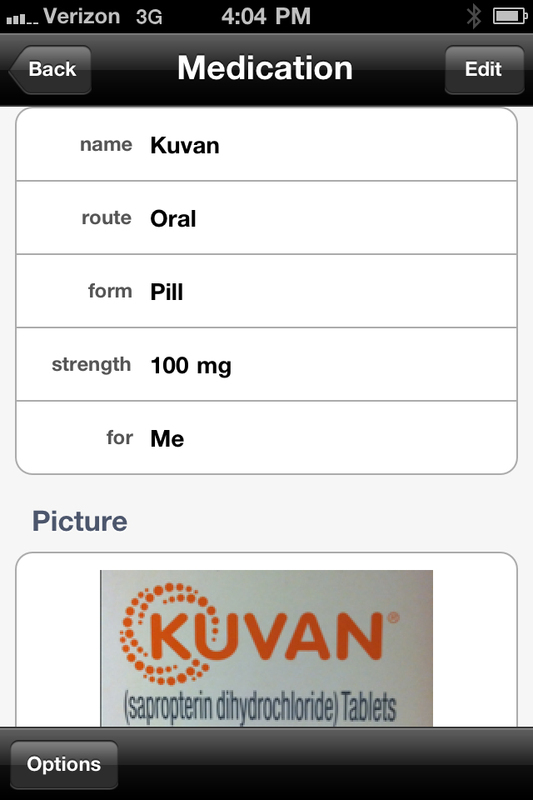 PKU patients can use RxmindMe to enter reminders for taking Kuvan, formula or even non-PKU meds like allergy pills, antacids and contraception. There’s no limit to how many reminders you can enter. For those parents with PKU kids, getting them involved with creating the reminders on the iPhone or iPad might even encourage them to be more independent in their treatment. 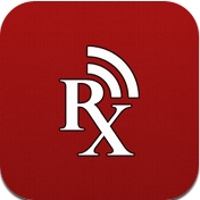 Finally, for those of you into social media, follow RXmindMe on Twitter—their Twitter handle, or name, is @RxmindMe—so you can get updates and tips for using the application.